The idea of making a story-based point-and-click adventure based on Minecraft, which is more or less the definition of open-ended, unscripted gameplay, might seem odd. And it is. But if anyone can pull it off it's TellTale, the studio known for making awesome adventure games based on other people's intellectual property. You can see for yourself in just under a month: Minecraft: Story Mode will hit the Play Store with its first episode on October 15th, just two days after it's available on the PC and consoles. Nice. Minecraft: Story Mode uses the block-building game's unique voxel graphics and build-it-all setting to tell a science fiction story. The voice cast is relatively star-studded, lead by Patton Oswalt (who's done voice work for everything from Pixar's Ratatouille to Rick and Morty) in the male protagonist role, or well-known voice actress Catherine Taber if you choose a female player-character. Like all TellTale adventure games, the gameplay is almost entirely driven by player choice, which affects the way the story unfolds and the characters react to you. TellTale's been building up a reputation for incredibly well-done episodic adventure games over the last several years. Tales From the Borderlands has managed to take a game series with a story that could charitably be called "serviceable" and turn it into a hilarious, emotional, and genuinely interesting narrative. I can't wait to see what they do with Minecraft, considering the enormous subculture that's formed around it. 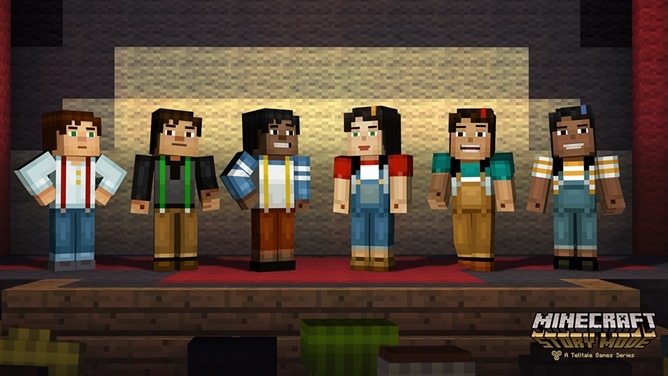 Minecraft: Story Mode will be episodic, and if it's like previous TellTale releases, each episode will cost around $5.